The work was published today in Nature Communications, and was led by Prof Lloyd Hollenberg at the University of Melbourne, working closely with researchers at the ARC Centre of Excellence for Quantum Computation and Communication Technology (CQC2T) to design the quantum molecular microscope. "Determining the structure of bio-molecules such as proteins can often be a barrier to the development of novel drugs," said Prof. Lloyd Hollenberg, Thomas Baker Chair in Physical Biosciences at the University of Melbourne. "By using quantum sensing to image individual atoms in a bio-molecule, we hope to overcome several issues in conventional biomolecule imaging, " Prof Hollenberg said. State-of-the-art techniques create a crystal of the molecule to be studied and use X-ray diffraction to determine the molecules' average structure. However, the crystalisation and averaging processes may lead to important information being lost. Also, not all bio-molecules can be crystalised – particularly proteins associated with cell membranes, which are critical in the development of new drugs. 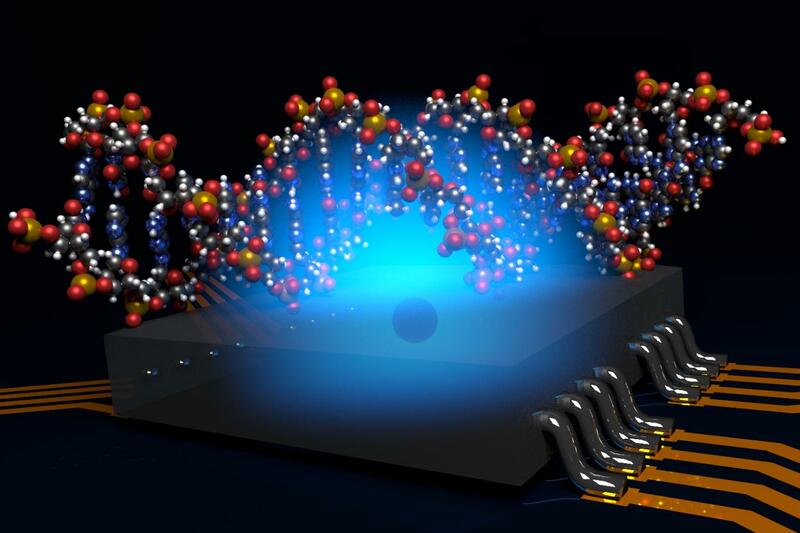 "Our system is specifically designed to use a quantum bit as a nano-MRI machine to image the structure of a single protein molecule in their native hydrated environments," added Prof Hollenberg. "As part of our research in quantum computing we have also been working on the nearer-term applications of atomic-based quantum technology investigating the use of a single quantum bit as a highly sensitive magnetic field sensor," says Prof. Hollenberg. "In a conventional MRI machine large magnets set up a field gradient in all three directions to create 3D images; in our system we use the natural magnetic properties of a single atomic qubit," says University of Melbourne PhD researcher Mr. Viktor Perunicic, who was the lead author on the paper. "The system would be fabricated on-chip, and by carefully controlling the quantum state of the qubit probe as it interacts with the atoms in the target molecule, we can extract information about the positions of atoms by periodically measuring the qubit probe and thus create an image of the molecule's structure." says Mr. Peruncic. "The system could be constructed and tested relatively quickly using diamond-based qubits. However, to capture really high resolution molecular images in the longer term, CQC2T's silicon-based qubits might have the advantage because they have very long quantum coherence," said Prof. Hollenberg. "The construction of such a quantum MRI machine for single molecule microscopy could revolutionise how we view biological processes at the molecular level, and could lead to the development of new biotechnology and a range of clinical applications."